Damaged Tooth or significantly Discoloured Teeth can be restored by the use of Crowns and Bridges. 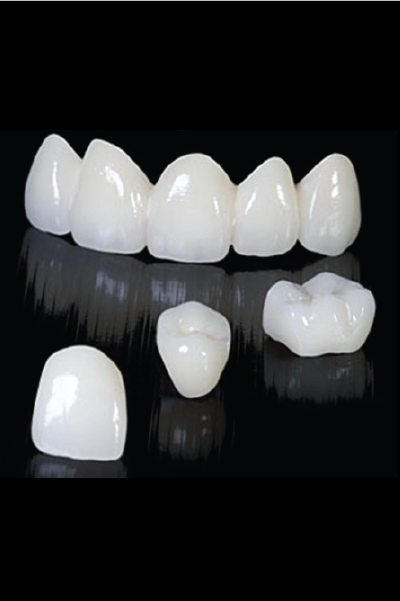 A crown is a dental restoration technique which completely caps or encircles a tooth or dental implant on being bonded to the tooth. It provides a younger and natural smile while significantly enhancing the life of the natural tooth. Today’s cosmetic dental crowns look and feel just like natural teeth. Made of durable dental porcelain or Zirconia, we offer cosmetic dental crowns and bridges in Gurgaon that are stain resistant and easy to care for. In fact, with proper care and maintenance, your dental crown can last for years. A dental bridge is used to replace missing teeth with the help of 2 or more crowns on either side of the gap which also provides support to the surrounding teeth. Dental Crowns and bridges offered at Dr. Khullar’s Dental Clinic n Gurgaon Sector 54 are made from LAVA/VITA technology which carries an unconditional warranty of over 15-20 years. The most common method of crowning a tooth involves using a dental impression of a prepared tooth by a dentist to fabricate the crown outside of the mouth. The crown can then be inserted at a subsequent dental appointment to save time and include strong restorative materials. I have been having a dental crown for 3 years now and it feels totally natural. The colour and shape compliments my neighbouring teeth. 15-20 years warranty with lifetime performance. Our team of dentists at Dr. Khullar’s Dental Clinic can provide Crowns and Bridges in Gurgaon that are meticulously crafted to perfection using digital technology. The clinic offers state of the technology for all the dental treatments to the patients. Call at the help desk to know details and cost of Crowns and Bridges in Gurgaon. We also offer affordable crowns and bridges in DLF Phase 5, Naraina Vihar, Golf Course Road or Sohna Road. Prior appointment is recommended.